Luckenbooths were shop along the Royal Mile in Edinburgh which stretches from St Giles' Cathedral down towards the Canongate. They were the city's first permanent shops that housed jewelry workers beginning in the 16th century. The Luckenbooth Brooch is a traditional Scottish wedding brooch given to the bride by the groom on their wedding day, and subsequently pinned to the shawl of the first baby to protect it from "evil spirits". The Luckenbooth has figures very similar to the Claddagh Ring, and a similar purpose of being a love token. 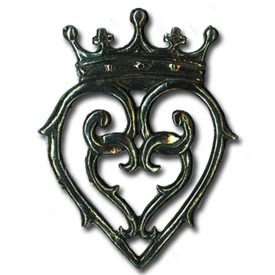 The luckenbooth charm also continues the traditional theme of heart and crown. The earliest records of heart-shaped brooches in Scotland date back to 1503. Pewter, measures 1 15/16" by 1 1/2". Made in USA.